Jude has a tooth that's hanging by a thread, which gave me the perfect excuse to do some sewing for my boy. Let me introduce the Monster Tooth Pillow. 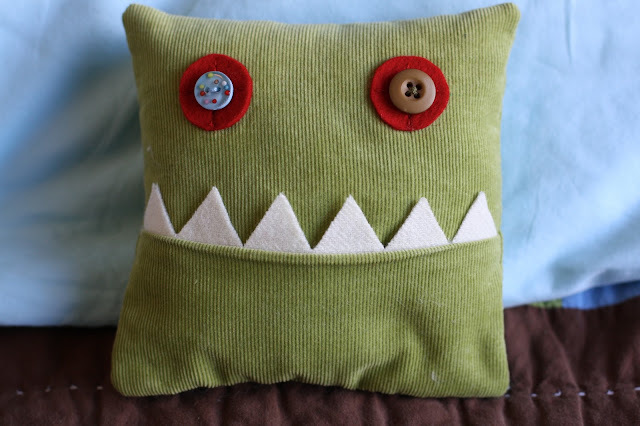 This 6" x 6" pillow eats teeth, only temporarily, until the tooth fairy replaces them with money. It was a breeze to sew and lots of fun, too! Jude wanted the eyes to be two different colors. He also contemplated giving him three eyes... or just one. There are lots of options with this guy. And lest you think that this monster pillow is only for the boys in your life, Indigo assures me that she wants to use him for her teeth someday, too. I offered to sew her one of her own, but she tells me she likes this one exactly as he is. So do I... though maybe, just maybe, I was hoping to sew one more. Oh this one is too cute Rachel! Thank you for your comment over at HG, I've always enjoyed stopping by your blog!